Sardine reef is a large off shore reef that slopes down to around 25 meters. There are no actual sardines here but the fish are so tightly packed that it derives the name of the dive site. 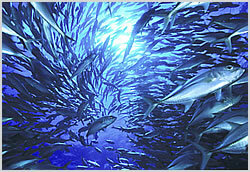 Great schools of fish block out the light, jacks, tuna, trevally, they're all here in huge numbers. There are also Australian Wobbegongs to be found here hiding under ledges and table corals. This dive really is a fish frenzy, you even need to stay close to your buddy if you want to keep them in sight for the living walls of fish.